Apparent onomatopoeia from these birds' calls making a distinctive "chick-a-dee-dee-dee" sound. 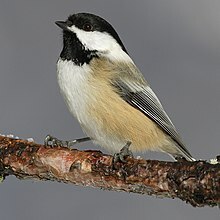 A small passerine bird (songbird) of the genus Parus or the family Paridae. This page was last edited on 24 January 2019, at 04:16.